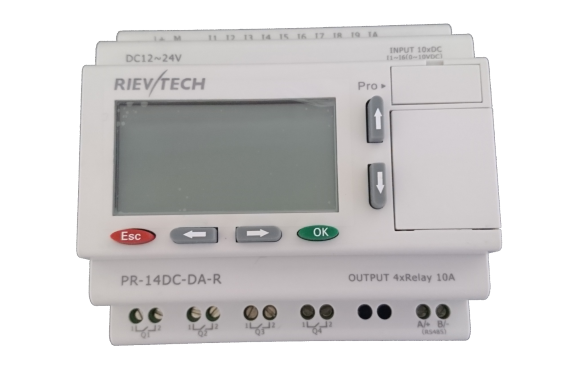 The Rie vtech PR Series of mini programmable logic controller is a reliable controller. Offering the flexibility to perform almost any logical process that would traditionally be performed using a multitude of conventional switch gear products and monitoring devices. Reliable and low cost solutions. Inputs – 4 analogue inputs (which can also be used as digital) and 6 digital inputs (10 in total). 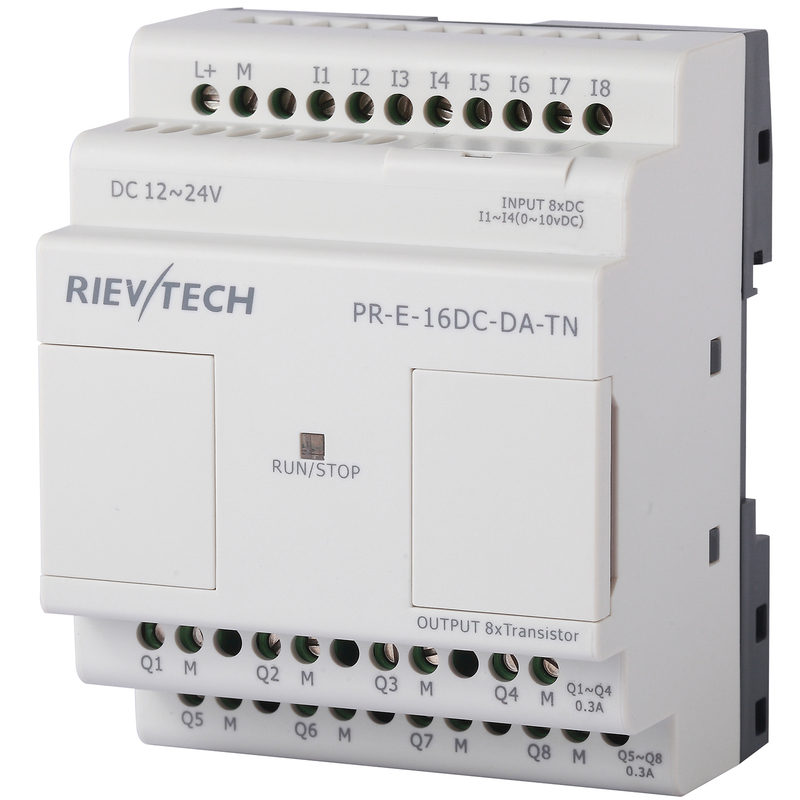 Outputs – 4 relays outputs. Additional expansion modules can be added to the main CPU if larger I/O capacity is required. A built in clock (with backup during power loss). A HMI (keypad/display) making it possible to view status and modify value setting. A simple programming method that uses a PC software application and function diagram blocks programming language and ladder programming is also available. Tank level control with automatic pump start for refill using an analogue sensor (such as a diver in the tank) allowing the user to set the trigger levels. Pipeline pressure control with automatic valve activation using and analogue sensor (such as a pressure transducer on the pipeline) allowing the user to set the trigger pressures to open or close the valve. Ruraflex timer with automatic pump start and featuring user selectable pumping periods. Additional features can be added such as automated daily pump start times, monitoring of no flow, etc. Proportional fertigation controller that activates a fertilizer valve/pump based on water meter counts and injects fertilizer based on fertilizer meter counts. Multiple fertilizer systems can operate off one controller and values can be adjusted by the system operator. Filter flush controller that can activate a filter flush program from an external input such as a differential pressure switch. Flush times can be modified by the system operator. These are just some of the numerous applications that this flexible product can be used for. Contact us to find out how we can assist you with your specific application needs. We have in-house programmers and system integrator s that are ready to help with your requirements. Download our product manual to find out more or go to downloads for additional support materials.